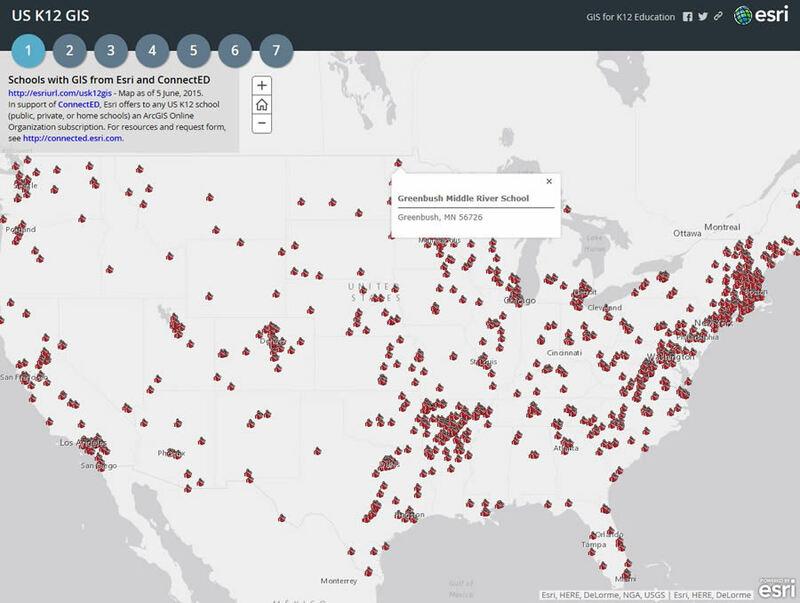 More than 1,000 schools have acquired free ArcGIS Online accounts. Just over a year ago, Esri answered President Barack Obama's call to join the ConnectED initiative, an effort to help all students in kindergarten through the twelfth grade in the United States become effective digital learners. President Obama asked private businesses to contribute technology such as computers and tablets, Internet connectivity, software, learning resources, and training for educators. Esri president Jack Dangermond offered every K –12 school in the United States—public, private, or home school—a free ArcGIS Online organizational account and accompanying instructional materials. Amazon Web Services, which provides essential infrastructure in ArcGIS Online, generously stepped up to help. Students can use the tools in ArcGIS Online to analyze data and make maps—instilling spatial-thinking skills that will help them with their school research projects and in their future careers. 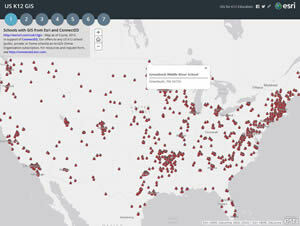 The specially configured ArcGIS Online organizational accounts offer what businesses, governments, and agencies around the world increasingly find valuable: a custom portal, galaxies of data, and a fleet of applications simple enough for grade school students to use yet robust enough for mission-critical or scientific work. Students and professionals use ArcGIS Online to build, host, and share content in a safe and secure environment. Students discover patterns and relationships in data. 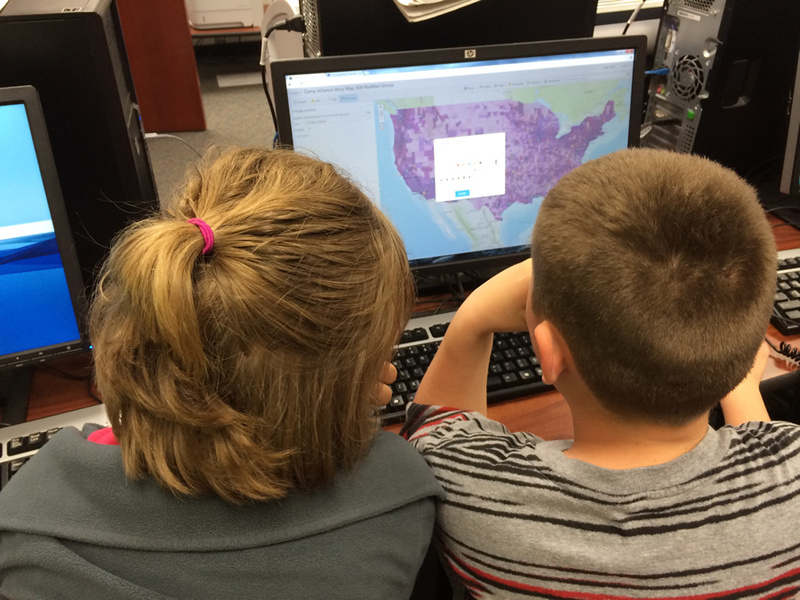 Children are using ArcGIS Online to track butterflies and whales, map great literature and local history, determine earthquake hot spots, monitor signs of climate change, and much more. They also can use ArcGIS Online to share results of their work. The technology helps students explore the multiple factors that influence complex issues, and then make decisions and solve problems—just like adults do. In the digital world, this is what students need most: experience in solving ill-defined problems, managing large inputs of data, asking questions about that data to uncover patterns, synthesizing information, and communicating the meaning of what was discovered. 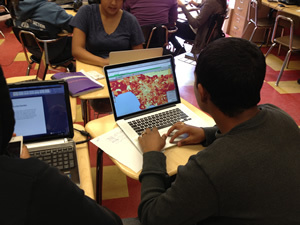 An 11th grade student in Los Angeles uses Esri technology to study demographics. ArcGIS Online will help them do that and more. Educators long to breathe life into material in the form of projects, which are like "educational Velcro," holding students' focus and bringing together scattered collections of numbers, concepts, and places. Education is not delivery but engagement, and projects let students make an investment in learning, follow their ideas, innovate, create, and share. Web-based mapping via ArcGIS Online means that students can work on their projects using any connected device, anytime, anywhere. They can create, work with, and share maps from a tablet computer at home, a classmate's smartphone, or a Mac-, Windows-, or Chrome-based computer at school. Fourth graders in Springdale, Arkansas, classify and symbolize their data. With this rapidly evolving technology, educators need GeoMentors to show them what's possible, get the ball rolling, and help explain how they can take advantage of ArcGIS Online organizational accounts. 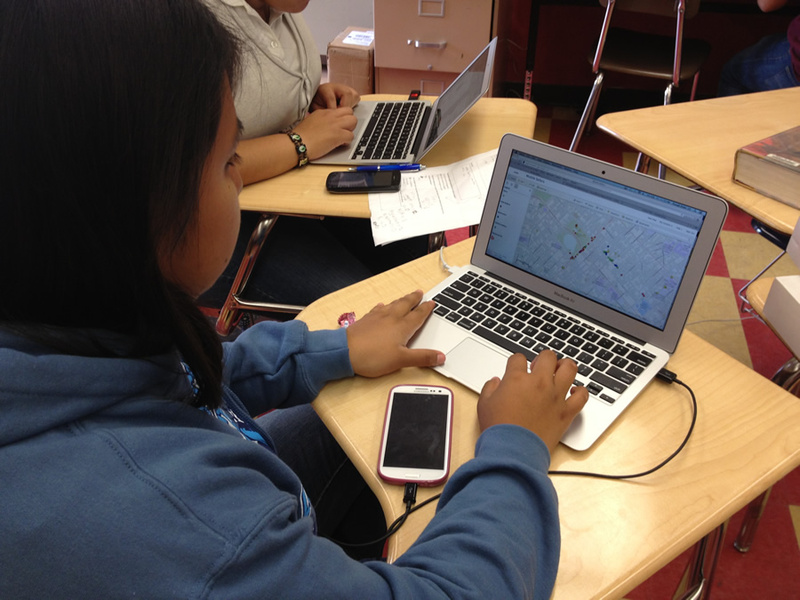 Resources include easy-to-use introductions that will help students get started on their learning quests using mapping technology. Please help educators engage their students in activities that build curiosity, critical thinking, and other skills that will last a lifetime. Spread the word about the free ArcGIS Online organizational accounts. Visit esri.com/ConnectED for more information.